A deeply restorative and protective shampoo for severely damaged hair that reduces the friction of cleansing and nourishes hair shaft. Reduce friction and stress on your severely damaged (level 3-4) hair with Kérastase Résistance Bain Thérapiste Shampoo. This nourishing, restorative cleanser coats the hair shaft while you’re washing to smooth and protect hair. It strengthens and revitalizes your hair while defending it against further damage. 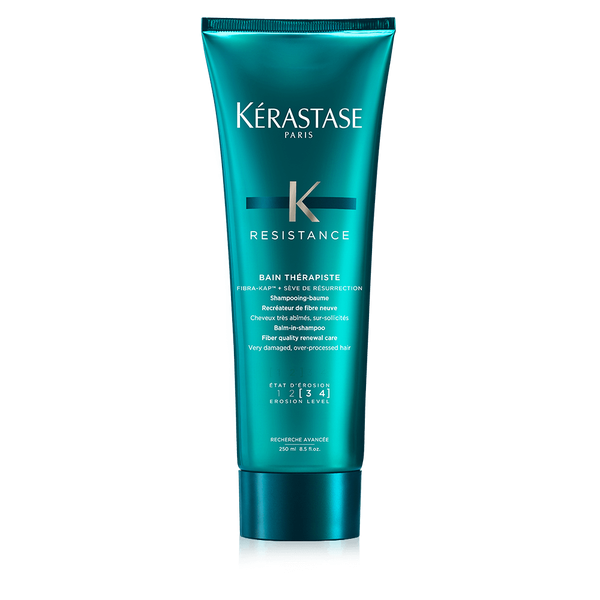 Kérastase Résistance Bain Thérapiste Shampoo is part of the Résistance range of products formulated to reinforce and restore moderately to severely damaged hair (level 1-2) or extremely damaged hair (level 3-4). Use a roughly quarter-sized amount of product, working gently through damp hair from tips through length until shampoo begins to foam. Moving from ends to roots, emulsify throughout hair, being careful not to scrub or rub. Rinse thoroughly and continue with regimen.